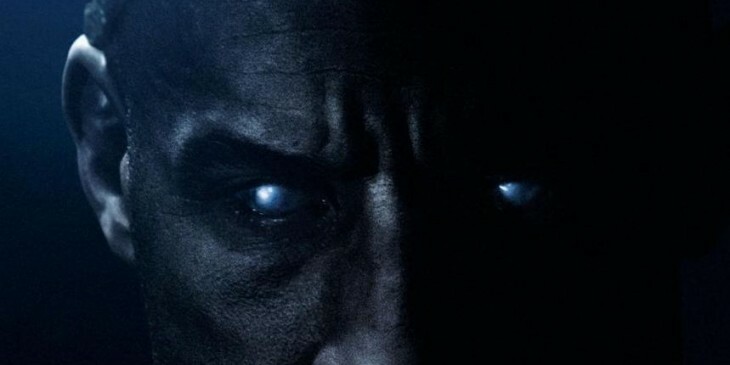 The first film in the Riddick franchise, Pitch Black, is a classic as far as I am concerned, a terrifying and smart sci-fi horror, with some real depth to it, and some unusually fleshed out characters, especially its main protagonist, the anti-hero Riddick, with his ever shifting moral principles. Then came its sequel, Chronicles Of Riddick, a film which can be lauded for at least attempting to go on a completely different direction, and not doing a bigger reboot of the first one, which so many modern sequels do. Sadly there is little else you can praise it for. Larger in scale and budget, it was an attempt to extend and explore the universe of Riddick, but it turned into a dour and rather boring space opera which satisfied nobody. Having gained some box office clout with the recent increasing success of the Fast & Furious franchise, Vin Diesel has brought his beloved character back nearly a decade later, taking his director David Twohy along. And they have listened to the criticism. Wisely back on a smaller scale, it is much closer in style and spirit to Pitch Black, although it smartly still does not go for an easy ride with a carbon copy of the first one. Riddick is composed of three different and distinct acts. The first one sees him attempting to survive in a planet where every living thing is hellbent on killing him. The second act seems him fend off with two different squads mercenaries and baddies, and this is where the film truly ventures into old school b-movie territory. As for the third act, well I will not go too much into details, but it is fast-paced and thrilling, reminiscent of the first film in some ways, even though it never quite rises to its level. There is a real pulpy/retro sci-fi vibe to it all, and the film is all the more successful for it. While I cannot say it has any scenes as memorable as what the first one offered, it is pure trashy fun, and in that respect it reminded me of the underrated Ghosts Of Mars by John Carpenter. My main criticism however is its running time. There is no justification for it to last as long as two hours, and would have benefitted from being shrunk to a tight 90 minutes. As much as I enjoyed the first act and its tale of survivalism, with some truly inspired and otherwordly imagery, when so much modern science-fiction is just so unimaginative and dull (see Avatar), its drags on for too long. Even the second act could have benefitted for a tighter edit. The first film was not all frenetic action, but was atmospheric enough to justify its slower parts, which cannot be said here. The action, when unleashed though, is impressive and satisfying enough, with some nice touches of gory violence. Vin Diesel is back in great form, bringing back the badass Riddick we know and love. And while some of the supporting cast is fairly forgettable, two actors stand out: Jordi Mella, as a particularly heinous and hilariously OTT bounty hunter, and Katee Sackhoff (Battlestar Galactica) as Dahl, a tough female mercenary. Which brings me to a point I feel the need to mention. Shortly after the press screening, there was a lone but vocal protest from a journalist on Twitter (despite the embargo, although to be fair the actual film wasn't mentioned), accusing it of misogyny and homophobia. This protest seems to be taking some traction, although I suspect it will soon fizzle out, like so many Twitterstorms in a teacup. I find this reaction particularly perplexing. Without giving too much plot details away, we establish early one that Dahl is a lesbian, as she "doesn't f*ck men, she just f*cks them up". And at one stage Riddick make some rather unpleasant sexual threat towards her in a "lesbians can be cured with a real man" kind of way. Later on, he grabs her bum. While I will not use the get out of jail card of "this is just sci-fi/OTT b-movie territory", it is very clear that this makes him come across as rather pathetic, and she is rising above it all. Plus when we see her in action, it is also obvious that she is more than his equal in badassdom and would have no problem fending him off. All the male characters are caricatures in this, and she is the only one who comes across as likeable . And if anything, it is nice to see an LGB character in a genre film that is fully integrated to the story, and not in a positive discrimination kind of way. While I agree that misogyny is rampant in blockbusters, I cannot understand while Riddick is being singled out, when there are literally hundred of examples which are much, much worse, if you are wanting to play that card. And just the same way as only a deranged person will act violently after seeing violence on screen, I cannot see how a mentally healthy man would want to come up with such attitude towards women after seeing that scene. Riddick is meant as a anti-hero anyway, not exactly one whose morals compass you should want to follow. Plus if you are going to go down that road, then what about women-hating James Bond? What about these myriad of films where women are just presented as bikini-clad eye candy? The Twitter outrage machine has been at it again and is becoming boring, as is the modern trend of over-analysing pop culture. Rant over! 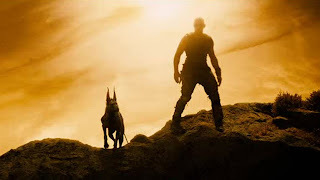 Riddick is a thrilling return to form for the franchise, and despite some minor reservations, it is a perfect Saturday night b-movie which I thoroughly recommend. Riddick. 2013 USA. Directed by David Twohy. Starring Vin Diesel, Katee Sackhoff, Jordi Mella. Out in the UK on the 4th of September. Had a fun time with this movie, even if it was very dumb. Nice review Laurent.